The Materials Science & Technology Conference is devoted to exploring structure, processing, and applications across multiple materials systems. 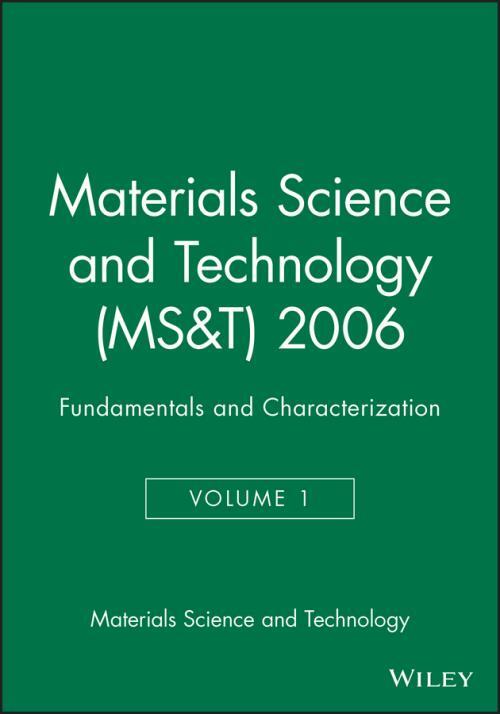 This proceedings volume contains the full text, in PDF format, of all of the papers from the MS&T'06 conference that were submitted for publication. The searchable CD can be browsed by symposium, author, or keyword. The MS&T Conference is organized by a partnership among the American Ceramics Society (ACerS), the Association for Iron & Steel Technology (AIST), ASM International, and The Minerals, Metals & Materials Society (TMS). Chemically Active Ceramic Nano–Particles and Nano–Structures. The Grain Size Effect on the Characterization of the Low Temperature Nanosized Synthesized SrTiO3– Oxygen Gas Sensors (Y. Hu, O.K. Tan, and W. Zhu). High Yield Synthesis of Nano–Crystalline Tin Dioxide by Thermal Decomposition for Gas Sensing Applications (C. Agashe, A. Garje, and R.C. Aiyer). Semiconductive and Electrochemical Gas Sensors. Flame Synthesis and Direct Deposition of TiO2 and SnO2 Sensors for CO, Isoprene, Acetone or Ethanol (A. Teleki, A. Tricoli, and S.E. Pratsinis). Effect of Electrode Thickness on the Performance of CO Sensor (X. Li, and G.M. Kale). Chemical and Biosensors, Membrane and Catalysis. Characterization of Metastable Polymorphous Particles of Tungsten Oxides (L. Wang, and P.I. Gouma). Synthesis and Impedance Properties of Nanostructured Carbon Nitride for Micro Humidity Sensors (J.G. Lee, S.Y. Kim, and S.P. Lee). Chemistry and Interfaces in Multifunctional Materials and Metal–Oxide Films. Strain Induced Enhancement of Functionalities in Multilayered Films. Residual Stress, Defects, Dielectric Polarization, and Thickness Effects in Ultra–Thin Film Barium Strontium Titanate (J. Clayton, P. Chung, M.W. Cole, J.D. Demaree, M. Greenfield, S.G. Hirsch, P.C. Joshi, and W.D. Nothwang). Effect of Nitrogen Doping on Structural and Optical Properties of Ge2Sb2Te5 Recording Layer (A. Shalini, H. Dieker, D. Wamwangi, M. Wuttig, and S.C. Kashyap). Growth and Characterization of Piezoelectric ZnO and PZT Films for Acoustic Wave Device (S.H. Yoon, and D.–J. Kim). Center for Computational Materials Design (CCMD) and Its Education Vision (Z.–K. Liu, and D.L. McDowell). Freely Accessible Crystallographic Internet Resources for Materials Science Education and Research (P. Moeck, and P. Fraundorf). Professional Development and Industry Collaboration. A Technical Elective to Stimulate the "Soft Skills" of Engineering Students (G.E. Dieter). Effective GARMCO University Partnerships for Employee Professional Development (N.H. Singleton, M. Essa, and E. Al–Aradi). Failure Analysis: Optimizing Design and Preventing Failures through Failure Analysis. Malice in Blunderland, or 4 Deadly Assumptions of Product Design (T. Nels). Joint Session with Joining of Advanced and Specialty Materials Including Affordable Joining of Titanium and Joining Technologies for MMCs: Joints and Bonded Layers. Failure Analysis of PVC Pipe Joint Separations (M. Bailey, and C. Kaufmann). Failure Analysis of First Stage Turbine Air Seal Assembly (R.P. Baron, J.F. Hill, and R.J. Claxton). Fracture Toughness Estimation of CMC Material by Virtual Testing Technique (B. Farahmand, M. Mehrinfar, and M. Hill). Numerical Methods for Estimating the Failure Pressure of a Ruptured Pipe (J.F. Kiefner). Frontiers of Materials Science and Engineering 2006: Microstructures and Properties – Linking from Nano to Macro. Skin Effect in Nano–Resistors (From the Mathematical Model to the Advanced Devices) (N. Popescu–Pogrion, and M. Tirnovan). Dependence of the Primary Dendrite Arm Spacing to the Solidification Processing Parameters for the Directionally Solidified Pb–Cd Alloys (A. Berkdemir, M. Gündüz, E. Çad rl , and A. Ülgen). Experimental Study of Stress–Strain Behavior of Particulate Materials in Compression Using Neutron Diffraction (X. Luo, D. Penumadu, K. An, F. Tang, and C.R. Hubbard). Surface Profiles Just Prior to Grain Annihilation (A. Vilenkin, and A. Novick–Cohen). A New Method for Modeling 3D Constitutive Relation Based on Orientational Components (C. Wei). Static Potential Effect Regime Model For Refractive Indice Material Compensation Thickness Film (C.–F. Chang, C.–H. Chan, and Z.–N.Wan). Advances in Titanium Metal Injection Molding (F.H. Froes). Knowing When to Hold Em: Patents vs. Trade Secret Protection (C.J. Brannon, and D.E. Novak). The Use of Porcelain Enamel Coatings on Reinforcing Steel to Enhance the Bond to Concrete (C.L. Hackler, M. Koenigstein, C.A. Weiss Jr., and P. Malone). International Symposium on Defects, Transport and Related Phenomena. Defects in the Bulk of Oxides I. Impact of Massive Production of Radiation Defects on the Structural Stability of Pure Zirconia (G. Baldinozzi, D. Simeone, D. Gosset, and S. Le Caer). Structure and Transport in Non–Crystalline, Ionic Materials. Structure and Relaxation Dynamicsin Superionic Glasses (A. Ghosh, and S. Bhattacharya). Defects and Transport in the Bulk of Oxides I.
Proton Incorporation and Defect Chemistry of Yb–Doped BaPrO3 (S. Mimuro, S. Shibako, Y. Oyama, K. Kobayashi, T. Higuchi, S. Shin, and S. Yamaguchi). Defects and Transport in Grain Boundaries and at Interfaces II. Ab Initio Study of Arsenic Pile–Up at the Si/SiO2 Interface (N. Gupta, W. Windl, L. Pei, G. Duscher, C. Steen, and P. Pichler). Defects and Transport in Metals. Modelling Steady State Deformation in Metals by a Novel Themostatistical Approach (M. Huang, P.E.J. Rivera Díaz Del Castillo, and S. van der Zwaag). Microstructural and Texture Requirements for Functional Materials. Surface and Bulk Passivation of Silicon Solar Cells by Hydrogen–Rich Silicon Nitride Layer (C. Li, B. Sopori, P. Rupnowski, A.T. Fiory, and N.M. Ravindra). Microstructure Sensitive Design of a Two–Phase Rotating Steel Disc (C. Landon, B.L. Adams, J. Parker, D. Huang, and M. Knezevic). EBSD Characterization of Stress Corrosion Cracking Behavior in Austenitic Stainless Steels (O.M. Alyousif). Recrystallization Texture of Copper Alloy Layers in a Laminated Composite (S.C.V. Lim, and A.D. Rollett). On the Development of Texture in ECAE Processed OFHC Copper (D.R. Waryoba, and P.N. Kalu). Subgrain Characterization of AA 5005 Aluminum Alloy Using Electron Backscatter Diffraction (EBSD) (S. Wang, A.D. Rollett, and J.P. Suni). Microassembly Techniques: A Review (S. Shet, R.D. Revero, M.R. Booty, A.T. Fiory, M.P. Lepselter, and N.M. Ravindra). Frontiers of Science and Society – ACerS Rustum Roy Lecture. Science, Technology and Society The Tightening Circle (G. Bugliarello). Deposition of BN from Boron Complexes (H. Çelikkan, . Uslu, G. Gündüz, and M.L. Aksu). Deuteriding and Low Temperature Structural Studies of Li–Based Complex Hydrides (W.–M. Chien, D. Chandra, A. Huq, J.W. Richardson, Jr., E. Maxey, S. Fakra, and M. Kunz). Effects of Heating Rate and Applied Pressure on Sintering of SiC Nanopowder with Stacking Disordered Structure (N. Toyofuku, Y. Kodera, T. Yamamoto, M. Ohyanagi, and Z.A. Munir). Ferromagnetism at Room Temperature in GaN Due to Calcination with CuO (P. Moeck, B. Seipel, R. Erni, A. Gupta, L. Noice, C. Li, F.J. Owens, N.D. Browning, and K.V. Rao). Crystallographic Databases: Past, Present, and Development Trends (P. Moeck). Potentiometric NOx Sensor for Automotive Exhaust (J. Park, and C.–O. Park). Precipitation Behavior of MX Nitrides in Cr–Mo–N–X(X=V,Nb,Ti) Ferritic Steels (D.S. Bae, W.S. Jung, S.H. Chung, K.T. Hong, and K.S. Lee). The Development of a New Test Rig to Study Thermal Shock/Fatigue Resistance of Tool Steels (M.A. Quiñones–Salinas, and R.D. Mercado–Solís). The Effect of Rotation Speed on Mechanical Properties of Commercially Pure Aluminium Joined by Friction Stir Welding (A. Kurt, B. Gulenc, I. Uygur, H. Ates, and M. Ozdemir). Types of Time–Temperature–Transformation Diagrams for Various Matrix Microstructures of Unalloyed Ductile Irons (L.S. Vassileva, S.V. Vasseva, R.L. Huston, and B.P. Bardes).